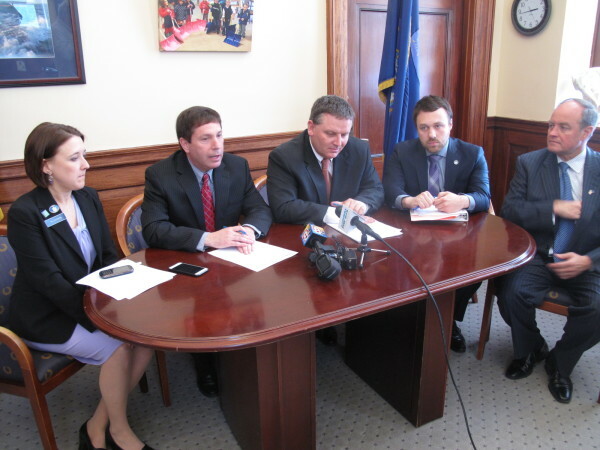 Republican legislative leaders (from left) Assistant House Minority Leader Ellie Espling, R-New Gloucester; House Minority Leader Ken Fredette, R-Newport; Senate President Mike Thibodeau, R-Winterport; Senate Majority Leader Garrett Mason, R-Lisbon; and Assistant Senate Majority Leader Andre Cushing, R-Hampden; are shown at a recent news conference in Augusta. AUGUSTA, Maine — The stage is set for a partisan showdown over a plan by Gov. Paul LePage to amend the Maine Constitution to eliminate the income tax by 2020. On Tuesday, LePage revealed that he had filed preliminary paperwork for a bill and had asked top Democrats and Republicans in the House and Senate to co-sponsor the plan by the end of the day. Perhaps predictably, the five GOP leaders, including Senate President Michael Thibodeau of Winterport, had given the plan their ringing endorsement by 5 p.m.
Democratic leaders, including House Speaker Mark Eves of North Berwick, announced they’d oppose it. On paper, that may seem to set up a protracted battle over the effort to kill the tax, which LePage hopes will be his legacy achievement. But the odds are firmly in the favor of Democrats, who hold a majority in the House. Any constitutional amendment needs two-thirds support in both chambers before it can be sent to voters for final approval. The Republicans’ majority in the Senate falls short of that threshold. “I expect it will be a very tough road for the governor,” said Rep. Sara Gideon of Freeport, the House Democratic whip, in an interview. The proposal would amend Maine’s constitution to bar the state from collecting income tax after Jan. 1, 2020, but says nothing about how to get from collecting more than $1 billion in income tax annually to collecting none in just five years. Lawmakers are chewing on the massive tax reform plan contained in LePage’s proposed $6.57 billion, two-year budget for fiscal years 2016 and 2017, which contains a reduction in the income tax worth more than half a billion dollars as its centerpiece. But a reduction has never been LePage’s end game. Since winning re-election in November, his rhetoric has focused on eliminating the tax altogether. “My vision for Maine is a Maine without an income tax,” LePage said during his State of the State address in February. Unless LePage can win quite a few Democrats to his cause, though, that’s an unlikely proposition. Still, the bill is poised to become a litmus test for lawmakers, for both their sentiment on taxes and their willingness to follow the governor’s lead. In other words, it’s much more likely to become fodder for partisan rhetoric and finger-pointing than it is to become law — something already apparent on Tuesday, before the bill had even been printed. House Republican Leader Ken Fredette, R-Newport, said in an interview that those who would ponder the bill’s likelihood of passage were asking the wrong question. “I think the right question is how committed are the Democrats to reducing the size of government and keeping more money in the pockets of businesses and individuals?” he said. Fredette and Thibodeau were joined by Senate Majority Leader Garrett Mason, R-Lisbon; Assistant Senate Majority Leader Andre Cushing, R-Hampden; and House Majority Whip Ellie Espling, R-New Gloucester, in co-sponsoring the bill. Democrats have criticized the tax reform plan in LePage’s two-year budget for allocating more than half of its income tax cut to the top 10 percent of wage earners, and have countered with their own proposal that they say spreads the tax cuts more equitably. On Tuesday, they said the constitutional amendment would benefit the rich and cripple the state’s ability to invest in education, infrastructure and other priorities. If the bill were to pass the Legislature, 2016 would shape up to be one of the most consequential elections in quite some time. Adding the amendment killing the income tax to the ballot would likely drive conservatives to the polls in droves, boosting the GOP’s prospects in a presidential election year — a time in the election cycle that usually favors Democrats. And if the presence of a presidential election and income tax referendum wouldn’t ratchet up the turnout stakes enough, it’s also the year that proponents of ranked-choice voting will put their referendum out to voters, and is likely to be the year Mainers vote on whether to legalize recreational marijuana.